If you’re looking to replace one or more missing teeth and are conscious of the costs involved, dentures may be the right solution for you. At QVC Dental Port Kennedy, we offer Australian-made dentures that will fit you well and be comfortable for years to come. 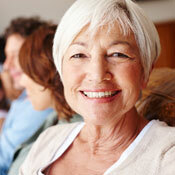 If you have no teeth or only need to replace one or a few teeth, dentures can work for you. We even offer immediate dentures so that if a tooth in your smile line is gone, you can leave our practice with a replacement filling the gap. The process for creating the right denture for you involves three to four appointments. In a partnership, your dentist and a technician at our laboratory work together in stages, ensuring the proper bite, fit and colour. Trials are completed before commissioning the final device. We recommend that you wear your new dentures for a couple of days, then return for any needed adjustments. Just like a pair of new shoes, it may feel unfamiliar at first, but soon there will be a perfect fit. Speak, chew and smile as you want. Contact us today to schedule your appointment! Same-day visits are available, and health funds are accepted.